We just finished the Woodland Heights home Tour and now it’s time for the neighboring Spring 2018 Houston Heights Home Tour. It is Saturday and Sunday, April 7th & 8th, 2018. The tour features 5 homes, ranging in age from 1 year to 110 years. A cool thing about this neighborhood is that often you can’t tell if a home is recent construction or over a century old. You can be sure though that each home will be totally unique. The Heights Home Tour will be an opportunity to see what great renovations/restorations look like; to learn about the history of these homes and the Heights; maybe get ideas on a future renovation you have planned. There is also a Candlelight Dinner and Auction, catered by Presidio, featuring live music, wine, local cheeses. This takes place April 6th at SPJST Lodge 88 (1435 Beall Street). This year’s theme is Boots, Bling & Bingo! 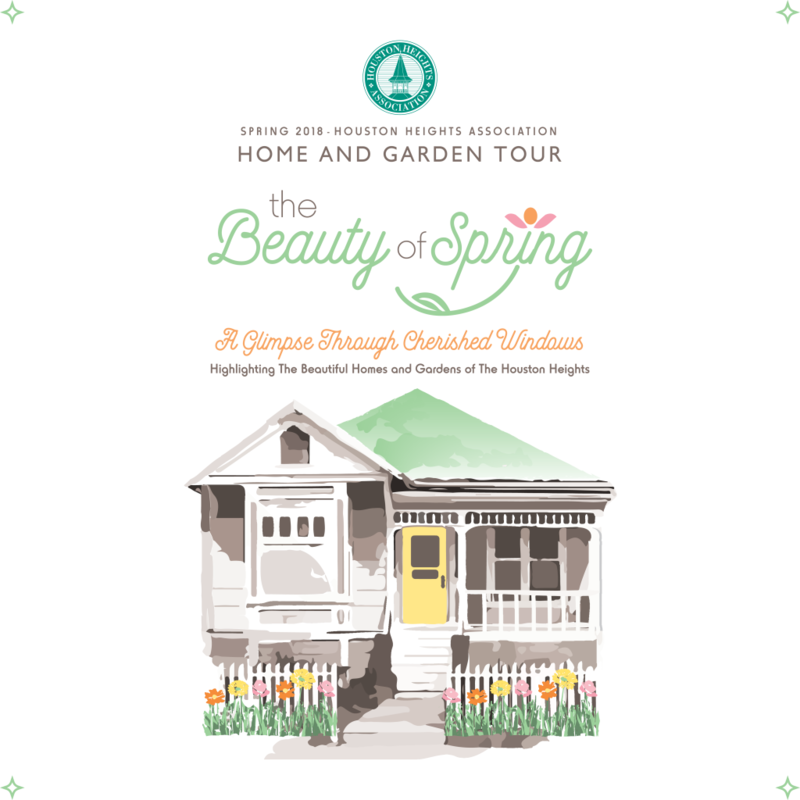 The annual event kicks off the Spring Home & Garden Tour Weekend, giving partygoers the chance to both preview the featured homes before they open to the thousands of annual visitors it brings to the Heights each year and take home fabulous live and silent auction items. Tour tickets are $20 in advance or $25 on days of event. Ticket price includes tour of all 5 homes and a shuttle bus from the Heights Fire Station to take you around. Tickets may be purchased online from HHA or several locations around the Heights. Details here. The Heights is a very walkable neighborhood, so if you choose to ride your bake, bicycle racks will be available at each home, and a “bicycle valet” will be on hand to assist with parking and securing bikes while the home is being toured. Schroder/Hanks House at 1845 Harvard St.
One of the homes on this Spring’s tour is a home renovated by premier Heights builder, HDT. This 1914 Mission Revival home is very distinctive in style. 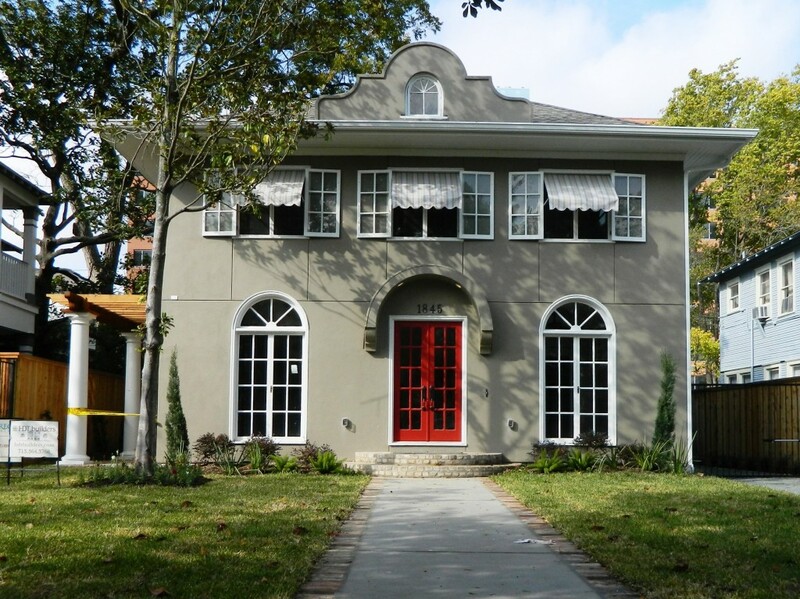 Houston Heights has a lot of Victorian homes and Craftsman style homes but very few Mission/Spanish style residences. In 2014, HDT gutted and expanded this 1500 SF house to just over 4000 SF and brought back original features that had been lost over the years. 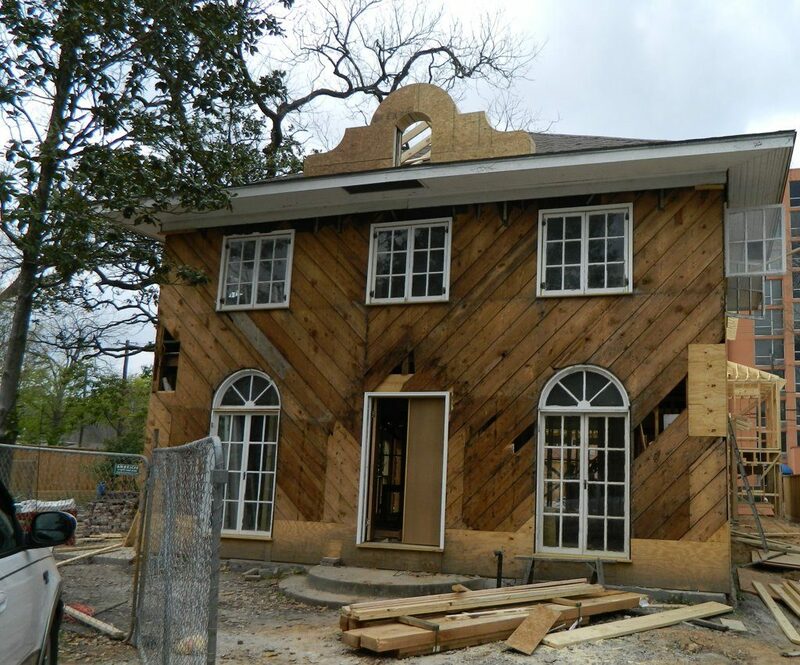 The photos below show this historic home nearing completion; while being gutted; and an original photo of the home. 1845 Harvard St: Restoration of a 1914 Mission Revival home. The photo above shows the house nearing completion. The parapet (the “Alamo” feature on top) and the side colonnade had been lost over the past century. Dee Todd Simmons (the creative force and site supervisor of HDT Builders) had the re-built to match the original photo of the house. Being in a historic district, Dee had all the original windows re-worked to keep as much of the original look as possible. 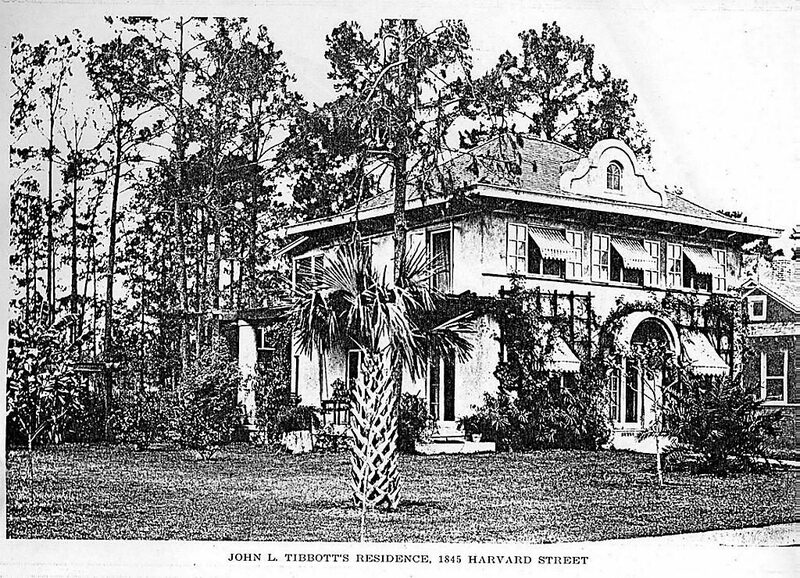 This photo was used to see features of the original house. Much of the detail had been lost due to neglect. Remodeling a Heights house is difficult enough. Restoring and expanding one while trying to keep historical features is a daunting task and is definitely not for the faint-hearted. If you didn’t see this house when I was marketing it for HDT, now is your chance to tour it. You may also view a couple of YouTube videos of the restoration on another post. This Mission Revival Home was built in 1914 and was originally 1,500 SF and expanded to over 4,000 SF. Dr. Steven Schroder & Mrs. Elizabeth Hanks purchased the home in 2015. Both from Missouri City and looking for a walkable historic neighborhood, the Heights was a perfect match. They fell in love with the historic doors and windows as much of the original architectural detail was retained. Hendrix Home 1330 Heights Blvd. One home, two addresses! Home originally built in 1907 with the address of 1319 Boulevard and sat next door to the Heights Funeral Home. In 1990, saved from a tear down it was moved across the street to 1330 Heights Blvd. Scott Home 1036 Cortlandt St. The Scott’s purchased this Queen Anne Bungalow in 2016 and began renovations. This 1920’s home had many uses for the past owner, it was milk truck filling station in the 50’s. The owners love the feel of the Heights, the people, the shops and restaurants, and easy access to outdoor activities. This home was built in 2017 by the owners who own L&B Limited Company, a custom home builder here in the Heights. The two-story farmhouse contains many beautiful features, including 100+ year old reclaimed ceiling beams, reclaimed wood floors, extensive millwork throughout and large front and side porches. The artwork displayed in the home is supplied by a local artist, Kellie Morley. This home was strategically designed for this active and growing family. Simmons/Berra Home 523 E 23rd St. If you want to know more about these premier neighborhoods start by looking at my pages on Houston Heights, and Woodland Heights.